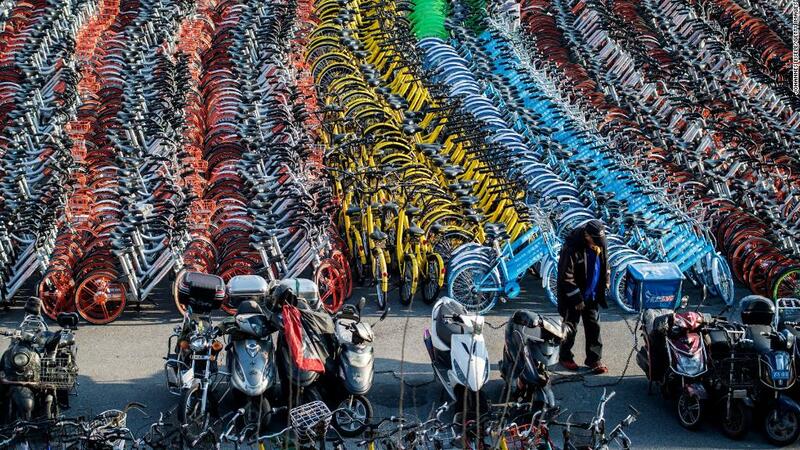 China's bike-sharing battle is about to shift into high gear. Mobike, a bike sharing company considered to be one of China's most valuable startups, has been snapped up by tech giant Meituan-Dianping. The company is best known for an app that connects hundreds of millions of users to services ranging from food delivery to travel bookings. It's often described as China's version of Yelp and Groupon combined. Terms of the deal, which was announced Wednesday, were not disclosed. Spokespeople for both companies declined to comment on specifics, though Bloomberg reported that Mobike was being acquired for $3.4 billion, with $2.7 billion in equity and $700 million in debt. According to data and research firm CB Insights, the 3-year-old startup was valued at $3 billion last year. Until recently, Mobike was expected to merge with its closest competitor, Ofo. The two companies are said to control as much as 90% of China's dockless bike rental market. In an internal message sent to employees Wednesday, Mobike's founding team said "we need to see more clearly that the company is facing increasingly fierce competition." Executives said the acquisition would allow Mobike to "maintain its branding and operational independence," as well as keep its co-founders on board. Chief Executive Davis Wang, President Hu Weiwei and Chief Technology Officer Joe Xia will continue to serve in their current roles, while Meituan CEO Xing Wang will become Mobike's chairman. Yu Xue, a senior market analyst of internet research at IDC China, said it was likely that Mobike's backers had pushed for the deal after years of concerns about profitability. They "want to get returns," he told CNNMoney. The deal fits into a new suite of offerings at Meituan, which is increasingly looking to compete on transportation. The company recently launched a ride-hailing service in Shanghai, and invested in Indonesian car-hailing firm Go-Jek, according to Reuters. "Both Meituan and Mobike have no better choice," said Xue. "And they need each other." The deal is expected to boost a dizzying, so-called "proxy war" that is being waged by Chinese tech behemoths Tencent and Alibaba, which back Mobike and Ofo respectively. Tencent is also an investor in Meituan. Another ride hailing company could also be affected. Didi Chuxing, a top ride-hailing company in China that squeezed out Uber in 2016 and is now a major investor in Ofo, will have to contend with "stronger" competition from Meituan, said Xue. Ofo declined to comment on its rival's deal on Wednesday. "Tencent wants to fight against Alibaba," said Xue. "The war will level up in the near future." -- CNN's Andrea Lo and Sherisse Pham contributed to this report.